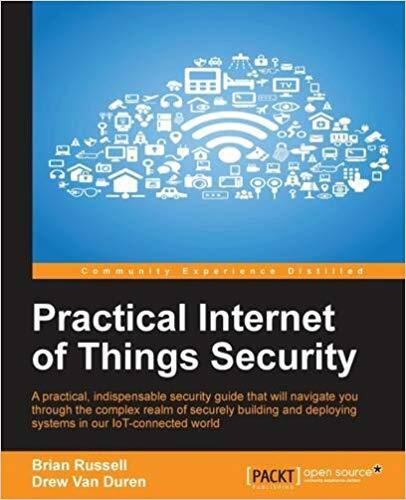 Who This Book Is For This book targets IT Security Professionals and Security Engineers (including pentesters, security architects and ethical hackers) who would like to ensure security of their organization's data when connected through the IoT. Business analysts and managers will also find it useful. Use Systems Security Engineering and Privacy-by-design principles to design a secure IoT ecosystem * Get to know how to leverage the burdgening cloud-based systems that will support the IoT into the future. In Detail With the advent of Intenret of Things (IoT), businesses will be faced with defending against new types of threats. The business ecosystem now includes cloud computing infrastructure, mobile and fixed endpoints that open up new attack surfaces, a desire to share information with many stakeholders and a need to take action quickly based on large quantities of collected data. It therefore becomes critical to ensure that cyber security threats are contained to a minimum when implementing new IoT services and solutions. . The interconnectivity of people, devices, and companies raises stakes to a new level as computing and action become even more mobile, everything becomes connected to the cloud, and infrastructure is strained to securely manage the billions of devices that will connect us all to the IoT. This book shows you how to implement cyber-security solutions, IoT design best practices and risk mitigation methodologies to address device and infrastructure threats to IoT solutions. This book will take readers on a journey that begins with understanding the IoT and how it can be applied in various industries, goes on to describe the security challenges associated with the IoT, and then provides a set of guidelines to architect and deploy a secure IoT in your Enterprise. The book will showcase how the IoT is implemented in early-adopting industries and describe how lessons can be learned and shared across diverse industries to support a secure IoT. Style and approach This book aims to educate readers on key areas in IoT security. It walks readers through engaging with security challenges and then provides answers on how to successfully manage IoT security and build a safe infrastructure for smart devices. After reading this book, you will understand the true potential of tools and solutions in order to build real-time security intelligence on IoT networks.